Above and below: Views of the Harbour Passage. Above: Along the Passage are vistas of the harbor. 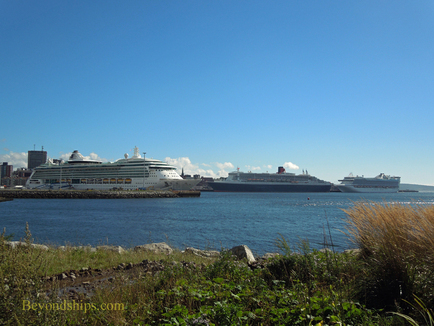 Here, left to right, Brilliance of the Seas, Queen Mary 2 and Caribbean Princess. 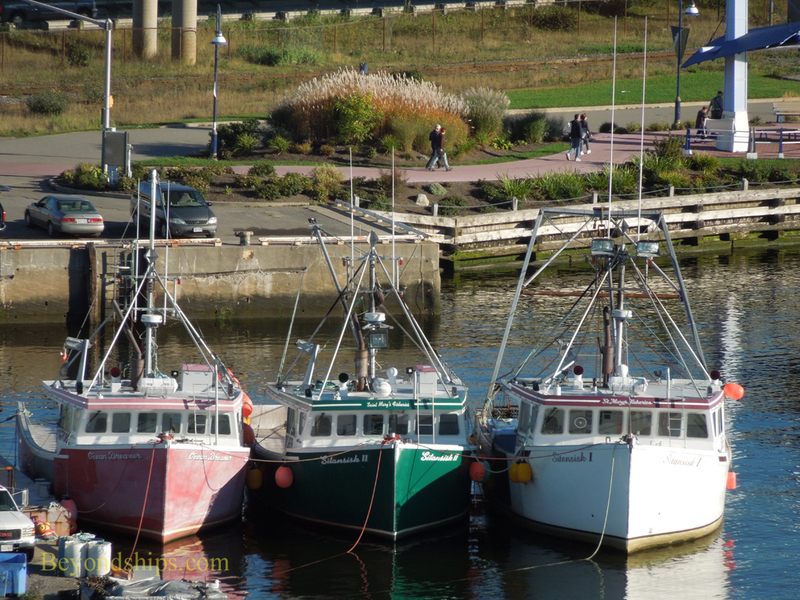 Below: Fishing boats berthed near the Passage. 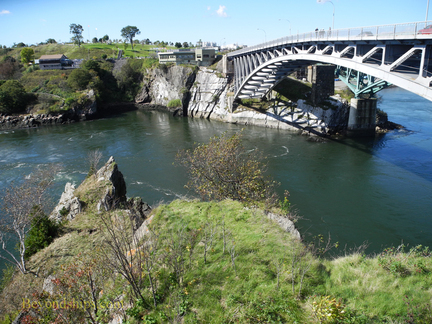 Above: The viewing platform overlooking the Reversing Falls. Below: The Reversing Falls at a peaceful moment. 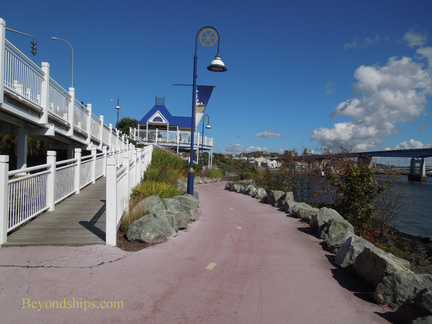 At the end of the boardwalk, is the Harbour Passage. 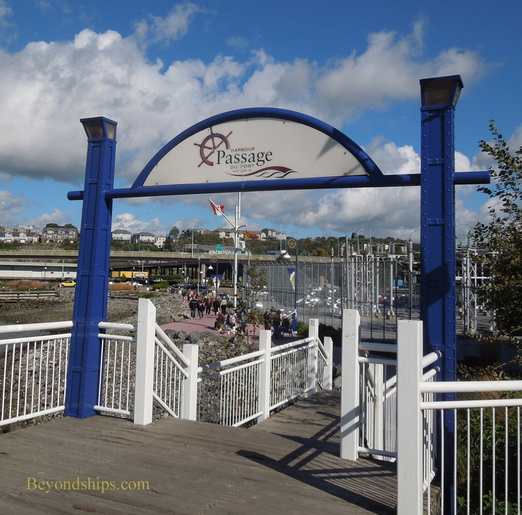 There is a blue painted gateway with a sign that proclaims that it is the Harbour Passage so it is difficult to miss. You descend to it down a set of stairs with white painted bannisters and rails. This blue and white paint scheme recurs all along the trail. In addition, the pavement at the bottom of the stairs is a redish pink color. As long as the pavement remains this color you are on the Harbour Passage. The Passage generally follows the shape of the harbor. Since there is a slip here, the trail follows the length of the slip before turning to the left. Not far after that you come to the Long Wharf where some cruise ships dock. If your ship is docked here, then all you do to walk to the Reversing Falls is turn left on the pink pavement at the entrance to the terminal area. (Note that there is no terminal building at the Long Wharf. Rather, the facilities are in tents erected on the wharf, which is fenced in). Saint John has done a nice job landscaping the trail. Plantings and/or large stones border the trail. In addition, there are occasional benches and plaques marking historical locations. Furthermore, there are some good places to view the ships docked in the harbor. Unfortunately, a portion of the trail is beneath a raised highway. The highway is far above you but there is still the noise. Saint John has done all that it could under the circumstances short of tearing the highway down, which I suppose would be a bit much to ask. While the highway is somewhat distracting, you get used to it after a few minutes. Eventually, the pink pavement turns right. You walk a short distance past a Navy building and then turn left where the path intersects with a busy road called Chesley Drive. Along the side of the road there is a wide sidewalk. But after a short distance, paralleling the sidewalk on the left is another portion of the Harbour Passage. 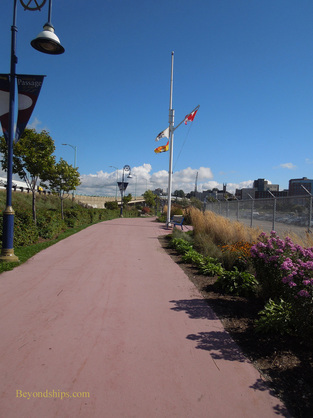 The Harbour Passage eventually merges again with the Chesley Drive sidewalk. Where it does, turn left and proceed up the gradual slope. There is not much to look at along this stretch of the trail. I remember passing several large commercial buildings but as I recall, much of the way, there was just grass bordering the sidewalk on one side and the road on the other. 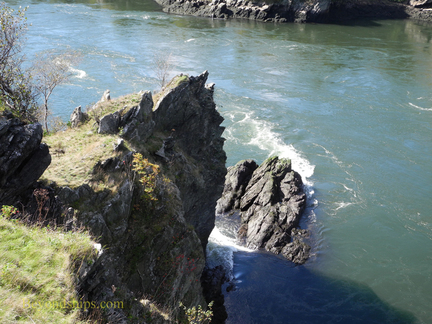 At the top of the slope, you at last arrive at the Reversing Falls. The road, now Bridge Road, goes over the gorge via an arched bridge. You can walk over to the other side where there is a restaurant with a viewing area but crossing the bridge is not for those who do not like heights. There is no real need to cross the bridge. 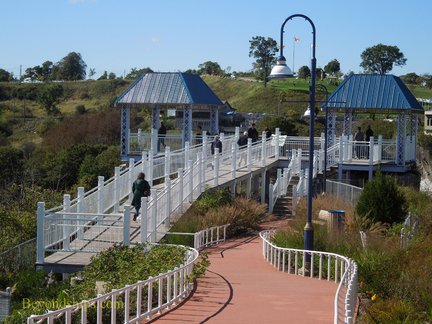 On the near side of the gorge, Saint John has constructed a viewing platform in the same colors and using the same Victorian-inspired architecture that it used for the features along the Harbour Passage. From the viewing platform, you can see down into the gorge as the river rounds a sharp bend. It is a pretty view. However, if you do not time your walk to get there at high tide, the river will look peaceful rather than dramatic. (See video). Walking to the Reversing Falls is quite pleasant on a sunny early fall day. The Falls is just over two miles from Water Street and it takes about 45 minutes to walk there depending upon your pace. Above: Near the Falls viewing platform is another vantage point where you can look out over the city and the harbor. 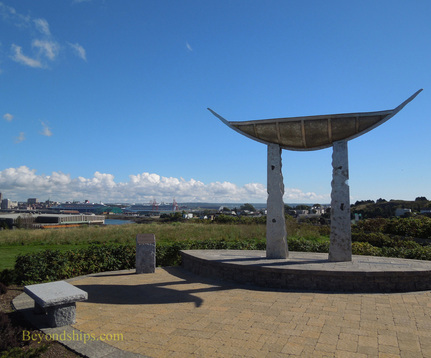 The sculpture is a tribute to the Viking explorers who may have visited the area.